Mercury Outboard decals made on quality media, resistant to outdoor conditions and Marina conditions. This same decal available for other engines upon request, please send us an email. 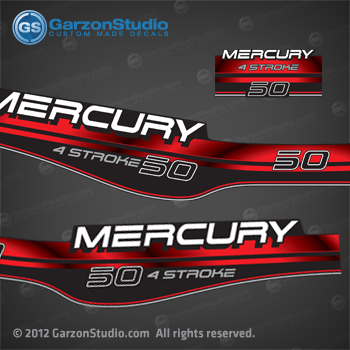 Mercury 50 hp 4stroke decal that wraps aroundport side, rear side and starboard side. All decals are UV protected and laminate to last longer smooth gloss finish. 40hp, 45hp and bigfoot versions decal and other custom color version available upon request. logo decals sold on 4 different sizes.